Artists have found creative ways to use as-yet unleased space for temporary shows and the storefronts on H Street have welcomed this harmonious collaboration. A new show will be opening at the Constellation at 14th and H on June 15th. 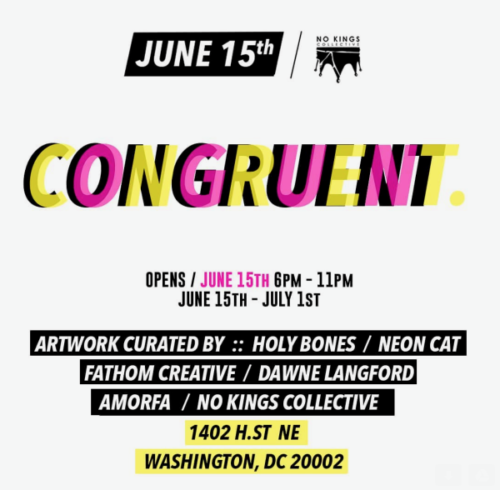 Presented by No Kings Collective, CONGRUENT, celebrates the DIY arts culture and brings together about local 50 artists that are organized in seven collectives. In a collective the artists work together on a common objective and share a common interest area or issue. This show will harness the “power of an artist-aiding-artist support system” and is being held in collaboration with the DC Office of Planning and Creative Placement.